Corporate social responsibility (CSR) is a relatively well-studied concept assuming that acting in the interests of local communities, company workers and society in general can be both ethical and beneficial for organisations from a strategic perspective (Hermawan and Mulyawan, 2013). While a certain degree of these activities is required by legislative provisions, it is widely accepted that CSR practices should be proactive and modern companies should seek the ways to go beyond these requirements in their efforts. However, there is no common view regarding the actual profitability of these initiatives for companies and practical outcomes may vary between different organisations and industries (Mahbuba and Farzana, 2013). Some companies manage to increase their revenues by investing into various CSR areas; however, other firms experience no positive effect. Dell, which is analysed in this report, is one of the largest manufacturers of technological products in the world. Beyond its commercial and technological development strategies, it also implements an extensive corporate social responsibility programme supporting company values. The aim of this report is to analyse the 2020 Legacy of Good Plan initiative of Dell and explore how it influences the financial performance of the focus organisation. Dell is frequently mentioned as a good example of excellent corporate social responsibility practices in the technology sector (Reynolds, 2018). The contribution to local communities was also confirmed by the Keep America Beautiful Vision award obtained by the company in 2014 (KAB, 2018). These results are largely attributed to the complex and balanced strategy describing the corporate change vision and organising individual CSR activities into a uniform synergistic structure. This sustainability vision was originally developed in 2012 in the form of the 2020 Legacy of Good Plan (Lenssen et al., 2017). This programme includes annual goals for the company and its partners across the supply chain, which provides the constant monitoring of implementation difficulties and instant feedback availability. At the same time, the main focus of the 2020 Legacy of Good Plan is put on the strategic areas of investment such as the individual development of employees and local communities, volunteering projects and environmental sustainability initiatives. The primary directions of the ‘2020 Legacy of Good Plan’ programme are based around supply chain management and optimisation, the reduction of the environmental footprint and the support of local communities (Dell, 2017a). Now, 90% of Dell’s material suppliers and 50% of the logistics partners are obliged to report their CO2 emission levels and have individual emission targets (Dell, 2017a). The company is planning to achieve a 95% coverage by 2020 to ensure that its global operations are highly sustainable. All suppliers are required to provide a certain degree of operations transparency to comply with working conditions requirements, financial reporting standards and other applicable practices supporting long-term sustainability. 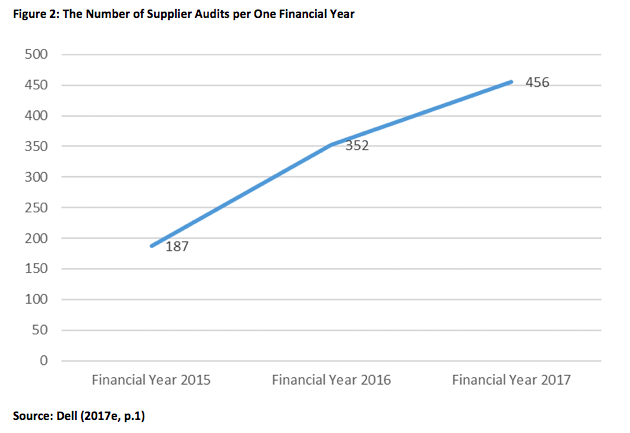 Additionally, 90% of Dell’s partners currently undergo regular audits in terms of their production and sourcing effectiveness as well as the responsible use of water (Dell, 2017a). From the environmental standpoint, the company uses recyclable packaging for 94% of its products and seeks to source packaging materials from sustainable sources (Dell, 2017c). It also obtains 24% of its electricity from renewables as compared to 11% in 2011. At the same time, Dell introduced trade-in programmes to recover as much as 177 million pounds of used electronics in 2017 while also investing into new software and hardware components design to reduce their energy intensity by 80% or more. 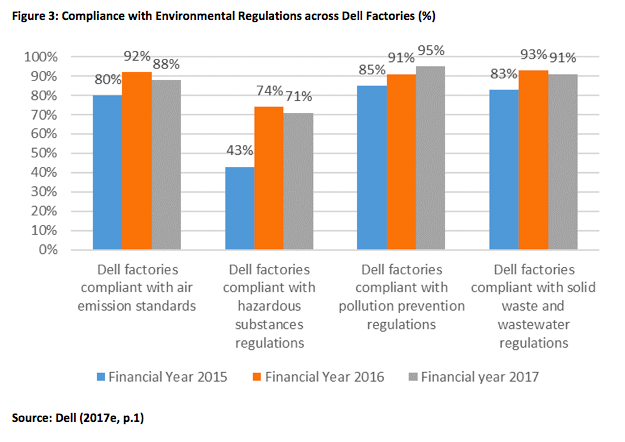 Additionally, the company seeks to achieve maximal compliance with applicable environmental regulations across its factories (Dell, 2017e), which is reflected in the following figure. Within the scope of social initiatives, as much as 44% of Dell employees were involved in volunteer activities amounting to the total of 3.3 million hours (Dell, 2017d). In 2017, local communities were assisted by the company in 71 countries with CSR projects benefitting 561,000 young people and 1.5 million persons in general. Additionally, the organisation strives to offer flexible work arrangements to 50% of its employees and increase university hiring by 25% to support students across the globe. Beyond the direct benefits such as cost saving and reputation management, these measures can also be viewed as a way to ensure the future sustainability of Dell’s employment operations. It was discovered by Pyoria et al. (2017) that millennial employees were highly attracted by the employers who maintained the transparency of their corporate practices and were engaged in various CSR programmes. While this study was performed in the Finnish context, its findings suggest that such companies as Dell have a greater chance to attract more skilled and talented young individuals than their traditional owner-driven counterparts, which can be viewed as an indirect contribution to their overall competitive advantage. The full 2017 fiscal year revenue of Dell amounted to $61.6 billion (Dell, 2017b). This constitutes a 21% increase as compared to the results of the previous period. The company also increased its research and development (R&D) expenses by 151% with the amount of total assets owned decreasing more than twofold. Similar results can be seen in the number of redeemable shares and stockholders’ equity. That said, the net revenue indicators on the following figure represent a steady revenue decline starting from 2012, which was the first year that the company implemented its current CSR programme (Statista, 2018). This outcome can be evaluated from multiple perspectives. On the one hand, the constantly decreasing revenues may indicate that the CSR initiatives did not generate any substantial benefits to compensate for associated expenses. On the other hand, the results of the 2017 fiscal year reflect a rapid profitability growth up to the 2012 level. This may suggest that Dell CSR activities had a strategic character and needed time to generate positive results. While the profitability declines between 2012 and 2016 can be a result of increasing CSR spending, this temporary effect can be compensated by the future benefits arising from better compliance and manufacturing efficiency (Sarkis and Daou, 2013). Firstly, the improvement of the company reputation can make it more attractive for its investors, corporate clients and customers. The conscientious spending trend popular with millennial consumers also suggests that the responsible behaviour of companies is rewarded in the medium-term and long-term perspectives, which is reflected in the recent growth of Dell revenues. Secondly, investing into sustainable sourcing and recycling operations has made Dell the largest global recycler, which is reflected in its closed-loop supply chain scheme for plastics that decreases manufacturing costs (Reynolds, 2018). Additionally, this leads to the increased compliance with applicable regulations such as the Registration, Evaluation, Authorisation and Restriction of Chemicals (REACH) initiative. Therefore, the company is protected against the introduction of stricter standards and can be certain that it maintains compliance in all global markets. Thirdly, the investments into the development of local talent pools and start-up companies have already resulted in several positive outcomes for Dell in the form of new innovative solutions (Womack, 2017). The introduction of flexible working arrangements and the constant revision of the 2020 programme elements also led to the reduction of office space-related expenses, individual emissions and data centre management costs (Wheeland, 2016). Similarly, the optimisation of packaging and recycling practices contributed to the optimisation of the manufacturing process. Overall, it can be summarised that the initiatives of the 2020 Legacy of Good Plan are strategically oriented and can positively influence the profitability of Dell in the medium and long-term perspectives, which is confirmed by the 2017 results. However, it was noted by Lin et al. (2015) that material benefits from CSR practices can be realised in several areas exclusively, while the majority of CSR activities may generate little or no effect. As Dell already has a system of monitoring the programme implementation effectiveness across various dimensions (Dell, 2017a), it may be more beneficial for the company to focus on several key areas to maintain the positive 2017 trend. Dell’s corporate social responsibility initiatives influence its financial performance in several ways. On the one hand, they ensure that the company maintains compliance with all applicable social and environmental regulations, which also increases its perceived reputation in the eyes of the end customer (Sarkis and Daou, 2013). The impact on financial results is also realised in the form of manufacturing and supply chain processes optimisation as well as in the greater efficiency of attracting and recruiting new employees (Pyoria et al., 2017). On the other hand, the first five years of the 2020 Legacy of Good Plan implementation have demonstrated a steady decline in revenues (Statista, 2018). While the fluctuations were within the scope of the previous year-to-year changes, this may suggest that the investment into corporate social responsibility initiatives can lead to temporary profitability issues. At the same time, the 2017 figures demonstrate a substantial revenue growth. This is in line with the findings of Lin et al. (2015) who discovered that CSR initiatives could take time to generate positive outcomes. However, more focused research can be recommended to maintain the current positive trend. Dell (2017a) “An annual update on our 2020 Legacy of Good Plan”, [online] Available at: http://legacyofgood.dell.com/content/dam/delltechnologies/assets/microsites/legacyofgood/2017/pdf/fy17-cr-report.pdf [Accessed on 10 January 2018]. Dell (2017b) “Dell Technologies Reports Fiscal Year 2017 Fourth Quarter and Full Year Financial Results”, [online] Available at: http://investors.delltechnologies.com/news-releases/news-release-details/dell-technologies-reports-fiscal-year-2017-fourth-quarter-and [Accessed on 10 January 2018]. Dell (2017c) “2017 Supply Chain Social and Environmental Responsibility Progress Report”, [online] Available at: http://i.dell.com/sites/doccontent/corporate/corp-comm/en/Documents/ser-report.pdf [Accessed on 11 January 2018]. Dell (2017d) “Communities”, [online] Available at: https://www.delltechnologies.com/en-us/microsites/legacyofgood/2017/communities.htm [Accessed on 11 January 2018]. Dell (2017e) “2017 Corporate Social Responsibility Report: Dell by the Numbers”, [online] Available at: http://www.dell.com/learn/il/en/ilcorp1/corp-comm/cr-report-numbers?c=il&l=en&s=corp&cs=ilcorp1 [Accessed on 12 January 2018]. Hermawan, M. and Mulyawan, S. (2013) “Profitability and Corporate Social Responsibility: An Analysis of Indonesia’s Listed Company”, Asia Pacific Journal of Accounting and Finance, 3 (1), pp. 15-31. KAB (2018) “Dell Inc. Receives Keep America Beautiful Vision for America Award for its Corporate Commitment to Driving Lasting Impact in U.S. Communities”, [online] Available at: https://www.kab.org/news-info/press-releases/dell-inc-receives-keep-america-beautiful-vision-america-award-its-corporate [Accessed on 11 January 2018]. Lenssen, G., Rhee, J. and Martinez, F. (2017) The Role of Corporate Sustainability in Asian Development: A Case Study Handbook in the Automotive and ICT Industries, Berlin: Springer Science & Business Media. Lin, C., Chang, R. and Dang, V. (2015) “An integrated model to explain how corporate social responsibility affects corporate financial performance”, Sustainability, 7 (7), pp. 8292-8311. Mahbuba, S. and Farzana, N. (2013) “Corporate Social Responsibility and Profitability: A Case Study on Dutch Bangla Bank Ltd”, International Journal of Business and Social Research, 3 (4), pp. 139-145. Pyoria, P., Ojala, S., Saari, T. and Jarvinen, K. (2017) “The Millennial Generation: A New Breed of Labour?”, SAGE Open, 7 (1), pp. 1-14. Reynolds, G. (2018) Ethics in Information Technology, Boston: Cengage Learning. Sarkis, N. and Daou, L. (2013) “Giving back to the community, an obligation or an option today? – Case of the educational sector in Lebanon”, International Strategic Management Review, 1 (1), pp. 59-64. 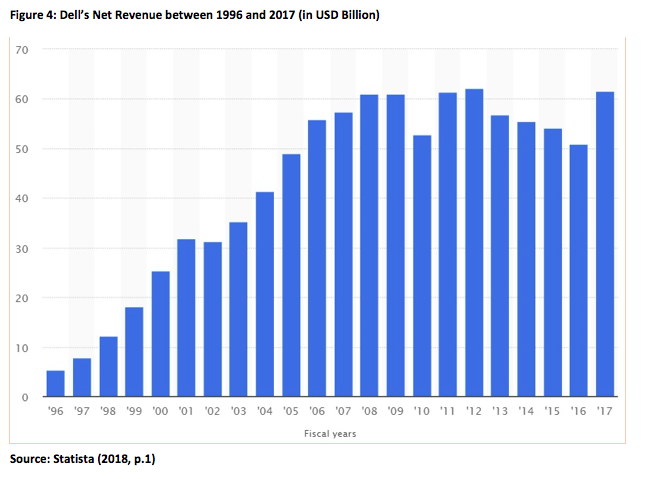 Statista (2018) “Dell Technology's net revenue from 1996 to 2017 (in billion U.S. dollars)”, [online] Available at: https://www.statista.com/statistics/264911/dells-net-revenue-since-1996/ [Accessed on 10 January 2018]. Wheeland, M. (2016) “Can a company ever claim to be making a better world?”, [online] Available at: https://www.theguardian.com/sustainable-business/2016/aug/24/company-claim-better-world-net-positive-dell-dow [Accessed on 10 January 2018]. Womack, B. (2017) “Dell Takes Venture Arm Out of Stealth, Aims to Spend $100 Million Annually”, [online] Available at: https://www.bloomberg.com/news/articles/2017-05-08/dell-takes-venture-arm-out-of-stealth-aims-to-spend-100-million-annually [Accessed on 10 January 2018].